At the end of World War I, the Ottoman Army achieved one of its greatest triumphs along the shores of the Caspian Sea in Azerbaijan and Dagestan. But the victory by the Ottoman “Kafkas İslam Ordusu” (Islamic Army of the Caucasus (IAC)) was overshadowed by the humiliating armistice imposed by the Allies on the Ottoman Empire. The armistice was signed on the British warship Agamemnon at the port of Mondros on the island of Limnos in the northern Aegean Sea on 30 October 1918, a week before the fighting came to an end in Dagestan. The battle for Petrovsk (Makhachkale), Dagestan, in early November ended in victory for the IAC’s North Caucasus Command (NCC). 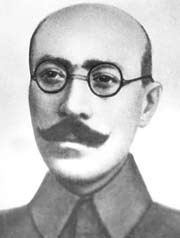 This was after a bloody and brutal battle with the Cossack forces led by Lazar Becherekhov, who was loyal to the White Russian leader General Anton Denikin and who had himself left Baku and chased the Bolsheviks out of their positions north of Baku in early August. Azeri and turkish soldiers near Baku during Battle for the city in 1918. Despite the victory over Becherekhov, though, by the end of November, the Ottoman troops had evacuated Petrovsk, based on the terms of the Mondros Armistice. The IAC’s exploits in seizing Baku in September 1918 are fairly well known. The operations of the IAC’s NCC, which seized Derbent and Petrovsk in Dagestan in October and November 1918, have been largely forgotten. 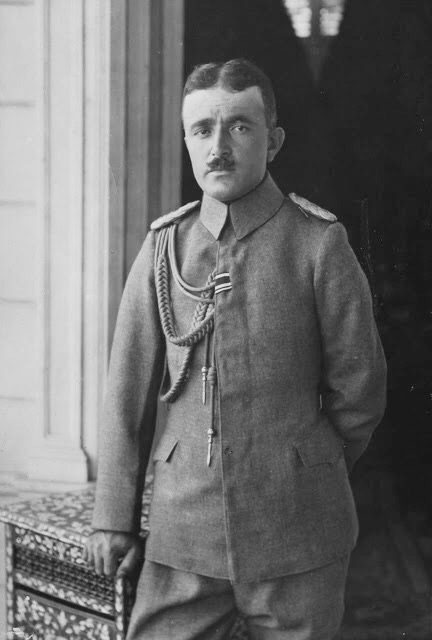 One of its members, Colonel Mehmet Tevfik, wrote in detail about the North Caucasus operations in 1919 and his account was published in Ottoman in the “Askeri Mecmua” (Military Magazine) in 1927. Certain ideas and the entirety of the operation described in these pages may be contrary to the principles of the Turkish Republic and ought to be. Nevertheless, I performed my duty in accordance with the ideas that were established, based on the decisions and actions of those in command at that time. I want to state clearly, as well, that this article has not been written to judge and criticize the operation, the politics and the military movements. I leave the information for my colleagues and those in charge of history lessons at the War College. I wrote it only to confirm, to thebest of my knowledge, the entirety of the operation and certain important phases and so that the operations and the battles that our heroic army engaged in in a battle space far from our homeland and under very difficult conditions will not be forgotten. The lines that I have written herein about the Northern Caucasus Operation during the last year of the WorldWar, were penned immediately following the operation in 1335 (1919). The Northern Caucasus Operation was the expansion and evolution of the Azerbaijan operation toward the north and marked both the beginning and end of the aforementioned Azerbaijan operation. The IAC/NCC set out from Ganja and began operations in Dagestan in July 1918 in Akhti, southwest of Derbent on the Caspian Sea coast, north of Baku. The Baku-Derbent-Petrovsk (Makhachkala) railway and the cities of Derbent, Petrovsk, Koba and Demirhan-Şura were under Bolshevik occupation. Since the Bolsheviks had seized the railway and major commercial centers, they had control of Dagestan’s lifelines. In places outside of the Bolsheviks’ occupation, confusion reigned. 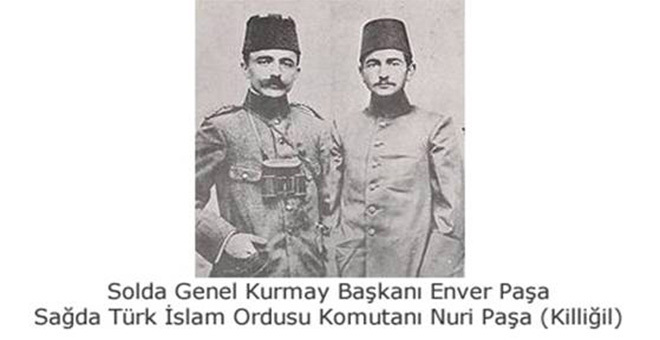 Left, Ottoman Chief of the General Staff Enver Pasha. Right, Islamic Army of the Caucasus Commander Nuri Pasha (Enver’s younger brother). with national principles, our position in the Caucasus must be strong and, in particular, the governments in Azerbaijan and the northern Caucasus must be reinforced, in order to strengthen our legal claims in these peace talks. For this reason, if you leave the 5th Division’s transport aside for now, after the 15th Division, the 12th Division is to be transported. I think that, in any event, when the time comes for transport the situation will have been completely clarified and decided upon. Keep in touch with us and try to quickly put the local Azerbaijani forces in order. Our forces currently in Azerbaijan and the 5th Division will remain in Azerbaijan subsequently to put the Azerbaijani military organization in order. Send a large amount of arms and ammunition to Azerbaijan. 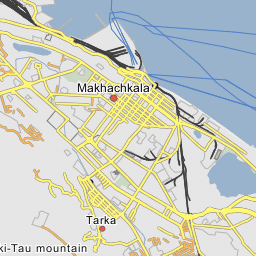 In response to Enver’s order, Derbent was seized relatively easily by the IAC/NCC on 5/6 October, with Bicherekhov’s retreating forces consolidating to the north at Petrovsk (today’s Makhachkala). Much more difficult battles faced the Turkish force as it headed north toward Petrovsk, as the Turks were continually challenged by Becherekhov’s well-organized troops, which were backed by armored trains and even Russian warships that fired on the Turks from the Caspian Sea. At 1330 hours, Nuri Bey’s regiment began to retreat under the effect of the enemy counterattacks with additional forces and scattered into the valley. Four officers from the 107th Regiment 1st Battalion were wounded and just 40 soldiers remained healthy. Subsequently, the enemy counterattack was turned toward the 56th Regiment 1st Battalion, which had seized the Tarki Mountain pass. 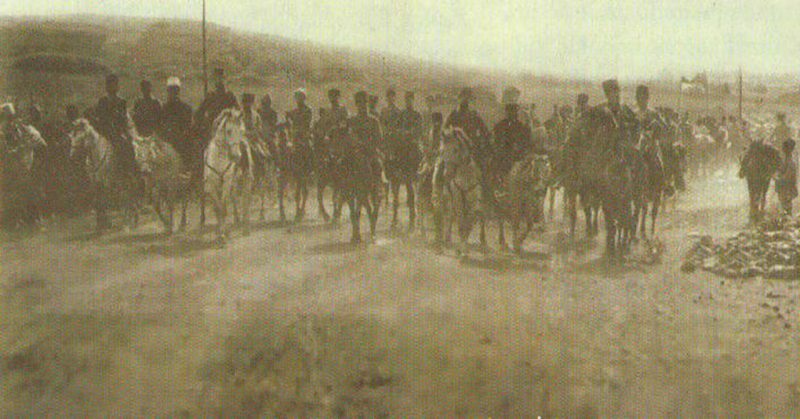 The heroic battalion, after spending its last bullets and bombs and after the deaths of two company commanders and valued soldiers, retreated in an anxious mood toward Ağaç Ağil. This retreat allowed the enemy to occupy the pass location and the line between there and Hill 1579. The enemy then rained fire down on our retreating troops, resulting is severe losses. 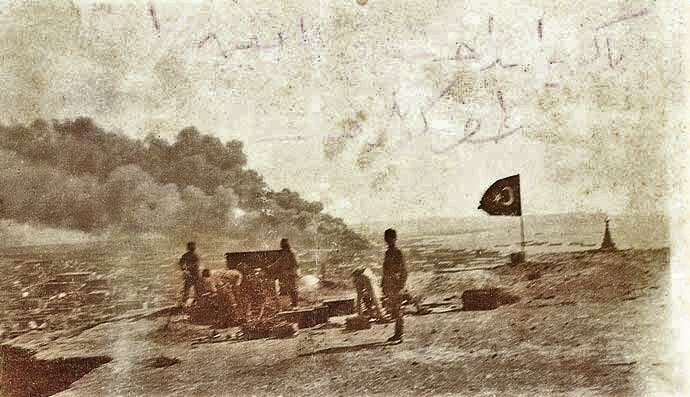 With the retreat of Nuri Bey’s regiment on the right and 56the Regiment 2nd Battalion on the left, the 56th Regiment 1st Battalion was left surrounded by the enemy but despite this horriblesituation, did not abandon its position. We mounted a counterattack to rescue the 56the Regiment 1st Battalion and take back the crest line. At a quarter past 2, the 38the Regiment 2nd Battalion’s machine gun company attacked toward the pass. 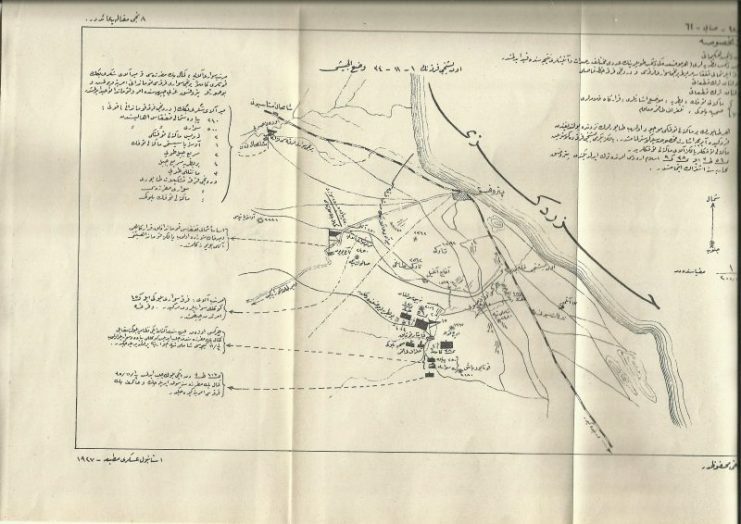 The 38the Regiment 3rd Battalion had already been sent toward Tarki so the Division was left with only 38th Regiment 1st Battalion in reserve. Battle map of Petrovsk (Makhachkala) from Col. Tevfik’s article, showing the situation on 1 November 1918. The Caspian Sea is at right and the railway is the dotted line along the coast, running toward the port of Petrovsk and then away to the west (left). With a counterattack by the 38th Regiment toward sunset the pass was retaken. The 38th Regiment on the right, and the 56th Regiment on the left, spent the night of 5/6 November at the crest line. Hill 1579, on the38th Regiment ’s right flank, was occupied by the enemy. By working the entire night, the regiment was assembled and sent for a counterattack on Hill 1579. Prior to dawn, this too was retaken and the situation rectified. The terrain on which this fighting took place had no roads for vehicles or even animals, for that matter. So food and ammunition resupply and removal of the wounded could only be accomplished under the harshest conditions that defy description. The ammunition boxes, the wounded and food were all carried on the backs of soldiers. On this night, like last night, there was no sleep. The troops had climbed, attacked, scattered and counterattacked continually for 36 hours. In short, they were exhausted by the tides of battle. The enemy’s hopes were completely dashed, its lines in disorder and the signs of fear began to show themself. Toward sunset on 6 November, a group of enemy soldiers could be seen fleeing in the direction of Petrovsk. There was a cease-fire at sunset and the Division was able to sleep the night on Tarki Mountain in safety. We were now masters of Petrovsk city and its plain. The enemy was 200-400 meters across from our Division’s front. The IAC/NCC’s occupation of Petrovsk on 7 November 1918, came a week after, first, the Mondros Armistice was signed on 30 October and, second, after Turkish leaders Enver, Talat and Cemal fled Istanbul on 1 November to Sevastopol aboard a German warship. The bloody battles of Dagestan, written about in detail by Colonel Mehmed Tevfik a year after the battles in 1919 (and published in 1927), reflect the horrors of war, the courage of warriors on both sides and, in this case, the futility of the efforts of the Islamic Army of the Caucasus. Nevertheless, the IAC’s success in the Caucasus was one of the few military bright spots for the Ottomans in WWI, but, alas, a forgotten one. Losses by the IAC during the campaigns in Azerbaijan and Dagestan were significant: 9 officers and 195 soldiers dead; 22 officers and 398 soldiers wounded; and 20 soldiers either missing or taken prisoner. 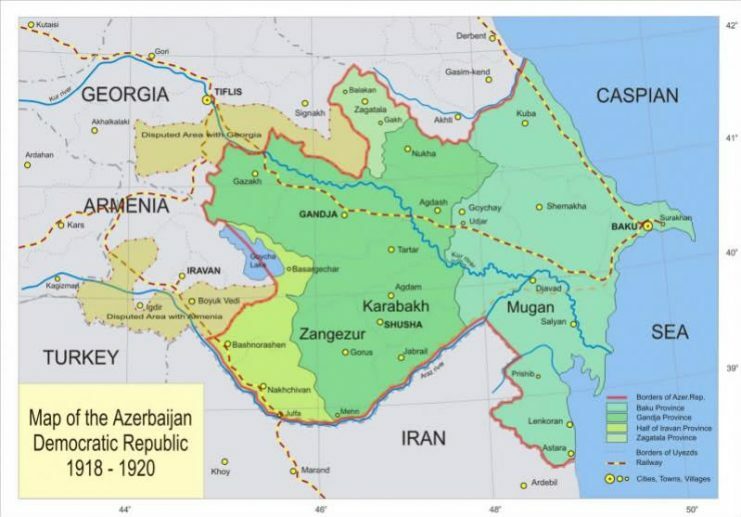 With the end of fighting, the Turks withdrew from this remote corner of the Great War’s stage and by 1921 the Bolsheviks/Soviets claimed control over all of the Caucasus, snuffing out the fledgling Moslem republics there and ending Enver’s dream of a Pan -Turkic empire stretching to back to Turkish origins in Mongolia.